Lying on an embankment where the brown bear left her, Jessica Gamboa knew she needed to move. Blood pulsed from the wound on her neck. Her head ached. The gash in her thigh was muscle deep. If she was going to die, Gamboa resolved, she would do it in a place where someone was likely to discover her. Less than 30 minutes before, Gamboa and her soldier husband had set out for a short run along a trail at Joint Base Elmendorf-Richardson, Alaska. Gamboa was training for a half-marathon and wanted to break in the bright orange running shoes she’d gotten the night before. Just as they usually did, the couple had begun their run together but soon became separated when the soldier sprinted ahead. Now, Gamboa crawled up the embankment and onto the trail and screamed for him. When no response came, she looked up at the sky and prayed for the strength to stand up and walk back to their truck nearly a mile and a half away. If she could get that far, if she could call 911, Gamboa believed she would live. Lying in a hospital bed 12 days after the May 18 attack, the soldier’s wife recalled the harrowing ordeal in a video interview released by the Army last month. Gamboa described seeing a bear cub as she rounded a corner on the trail near Fossil Creek and Pole Line Road 20 minutes into her run. The mother bear couldn’t be far away, she said to herself. The thought had barely passed when Gamboa spotted the adult animal galloping toward her. Gamboa put her hands out as if in surrender. The bear kept coming. “Everything happened so fast. Whether she lashed me or bit me, I couldn’t say,” the soldier’s wife recalled. The mauling lasted several minutes. Toward the end of the attack, the bear picked up Gamboa and carried her across the road and down the embankment, where the animal left her. “While this was all happening, I played dead. I played dead the best I could. I didn’t make a noise or scream. I just completely surrendered,” she said. Gamboa rose, placed both hands over the wound on her neck and limped uphill toward the couple’s vehicle. She was nearly there when she saw a truck heading toward her. Disoriented, she at first thought it was her husband. It was a stranger, a combat medic who was headed for a fishing spot. Army Sgt. Collin Gillikin thought the woman was covered in mud. As he got closer, he realized she was stumbling and holding onto her neck. It was blood, not mud. He stopped the truck. “She just looked at me and I said, ‘Whats going on?’ and she said she was attacked by a bear, and I couldn’t believe she was still standing,” Gillikin said in an Army video. He helped her into the truck and headed for the hospital, calling 911 on the way. Meanwhile, her husband realized she was missing. They were reunited at the base hospital, where Gamboa spent about an hour before she was transferred to Alaska Native Medical Center. She was in surgery for more than five hours. The bear had nearly torn one of her ears from her body. Doctors applied 10 stables to a head wound. Her neck was fractured and puncture wounds covered her body. The recovery had been painful, said Gamboa, who was still trying to fully comprehend the attack 12 days later. 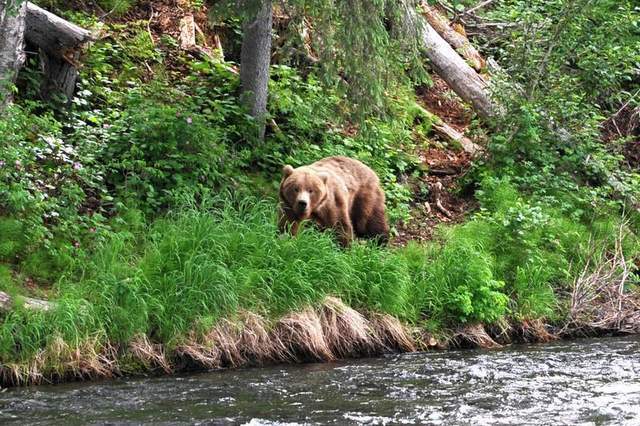 The brown bear attack was the first on the base in decades, said conservation law enforcement officer Mark Sledge, and he and other JBER officials used the opportunity to remind people about the dangers of the Alaska wilderness. Don’t be out there alone, he said. Carry bear spray and make plenty of noise to avoid startling an animal. If you are attacked, play dead. Gamboa said she also hoped she could serve as a cautionary tale. Watch Gamboa tell her story.